Electronic Code Locker Lock with Master Key MK731 - China Electronic Push Button Locker Lock Manufacturer: Electronic Push Button Locker Lock, Code Lock, Keyless, Master Key, Zinc Alloy, Bright Chrome. 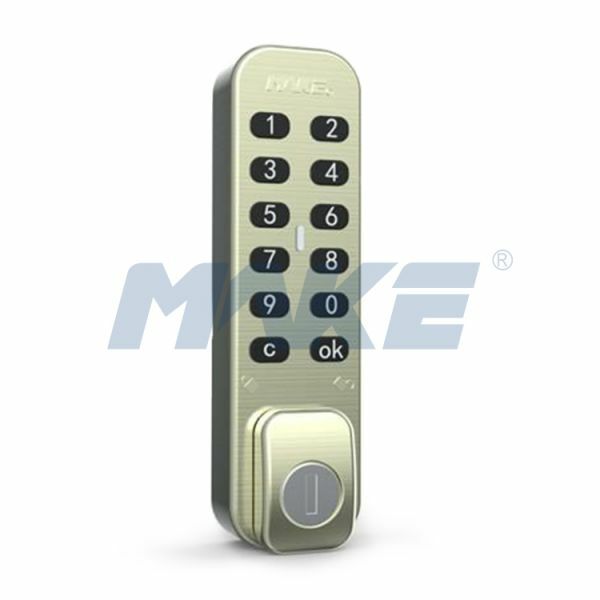 Name: Electronic Code Locker Lock with Master Key MK731. 1. Keyless Intelligent code locker lock. 2. Easy to install and operate. 3.Two modes of use: Private use and Public use. 5. Master Key for emergency opening. China Zinc Alloy Cam Lock Manufacturer: 17.5mm Zinc Alloy Cam Locks, Zinc Alloy Disc Detainer Cam Locks, Secure Disc Key System, Weather Resistant. China Rod Control Lock OEM Manufacturer: Rod Control T-handle Locks, Model MK201, Three Type Of T-handle And Nut For Selection, Zinc Alloy Material. China Mini Tubular Push Lock Manufacturer: Mini Tubular Push Lock, Tubular Push Locks, Shiny Chrome Finished, Both Type of Inner Structure. China Combination Laptop Lock Supplier: Combination Laptop Locks, 4-digit Resettable, Green Nickel Plated, Easy-view Window On Combinations. Make Locks Manufacturer: Security Lock and key Systems OEM for Cam Lock, Cabinet Lock, Key Switch Lock, Vending Machine Lock, Locker Lock, etc.